Internet is a global network that connects millions of computers across the world. It uses standard internet protocol suite (TCP/IP) to connect billions of computer users worldwide. It is set up by using electronic, wireless and networking technologies. It is the fastest mean of sending or exchanging information and data between computers across the world. It is believed that the internet was developed by "Defense Advanced Projects Agency" (DARPA) department of United States. And, it was first connected in 1969. 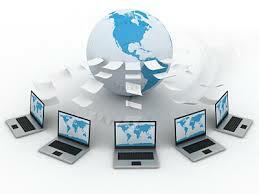 World Wide Web: It is a collection of billions of web pages or documents that can be viewed with a web browser. Email: It enables the users to send or receive messages online. Social media: It includes the websites and apps that enable the users to share pictures, comments, audio and video. Online games: People can play online games if they have internet access. Software updates: People can download latest versions of operating system, application software and other software from the internet.